Our Church Board has approved the refurbishment of 13 Stained Glass Windows in our sanctuary. Today, I got word that the company doing the work will come to remove the first of those windows – the large window featuring the story of Mary and Martha from Luke 10. It’s pretty exciting to get this work underway after so many months of discernment. As I sat thinking about the removal, refurbishment, and reinstallation of this first window, I realized that for several weeks there will be plywood in the space of that large window behind the choir loft. So, I went into the sanctuary to mull over what we might do with the bare plywood during the weeks the window is gone. I sat staring at the window for awhile. It is such a beautiful work of art from a time when Christians really valued the ability of art to inspire us and teach the stories of our faith. Contemporary church buildings are so often bare metal boxes devoid of art and the stories of faith which they communicate. And as I gazed closer at the window in a prayerful sort of way seeking to hear the details of the Mary and Martha story that the image sought to teach me, I began to see the image in a new way. I looked closer and closer at it and discovered details that I had previously missed. I literally got up in the window sill staring at different details of the painting within the glass. Our windows are not just geometric configurations of glass. Each colored glass piece is hand painted to create an incredibly detailed picture. Simply sitting in a pew on a Sunday morning does not give one the full appreciation of the details painted within the glass of the windows. But when you get up close to the window, you begin to see it in a completely new and beautifully detailed way. The shading in each piece of glass is so intricate. 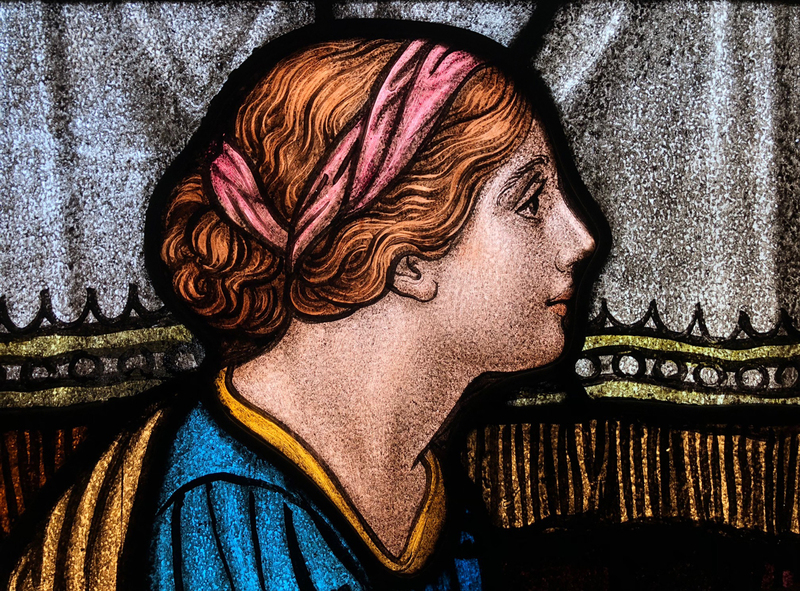 Even fingernails, strands of hair, eyebrows, and lips are carefully shaded onto the glass. The image is so elaborate up close it begins to come to life! And if you look close enough, you may just discover the immense beauty that the hand of God is painting into your life, for God is painting details within you that tell a story of love and grace.